We’ve just mailed the image sets! Phew! Please check your mail – and ensure that we have a correct valid email address for you/your team/school/group. Note also: you will find a set of RAW images in each image archive; these are the original data images as recorded by the VMC on board MEX, and as retrieved on Earth. For details on working with these, VMC blog. In some cases, not all targets are fully centred in the middle/centre of the image. 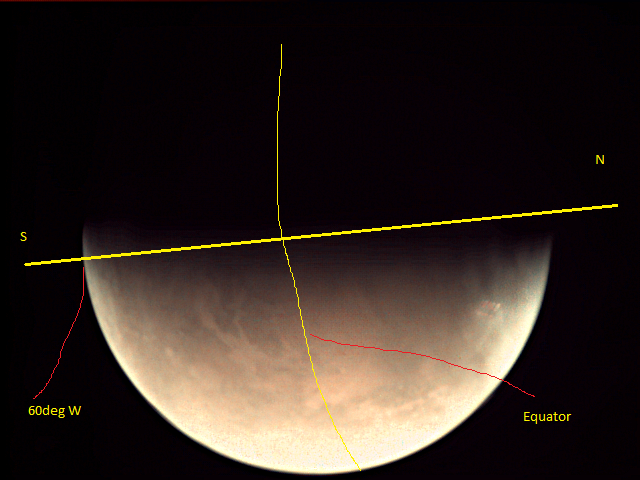 This is a function of the final choice in how Mars Express was pointed and executed the images, and allowed us to generate the highest number of images for the most requested targets. The images provided to you via the URL above are exclusively for your use at this time. ESA will publish them later in the VMC Blog, but you can expect to have them for your sole use for the next approximately 6 weeks. Note that in some of the ZIP/RAR archives there is a README file providing you additional information. The image files provided to you are licensed under a CC license (see CC Terms). You are allowed to reproduce, distribute, adapt, translate and publicly display the images provided that they are accompanied by an acknowledgement that the source is credited as ‘ESA – European Space Agency’, a direct link to the licence text is provided (see example below) and that it is clearly indicated if changes were made to the original content. Adaptation/translation/derivatives must be distributed under the same licence terms as this publication. Several requested imaging targets didn’t work out very well, either because of the dust or the lighting conditions, or because the image just simply doesn’t show the target well. For these, we dug through the VMC archive and provided some better-quality VMC (or other) images from past observations that do show the requested target adequately. As part of your participation, you and your school, club or group agreed to use the images in a scientific or artistic project that makes full, imaginative use of the visual information they contain. Your project must be shared with ESA, and must be submitted within the end of the current academic year or 31 July, whichever comes first (see all details via Registrations terms). You may share your project with us via email (vmc@esa.int) or by posting a comment here in the Mars Express blog (http://blogs.esa.int/mex). You may send us questions via the blog at any time as well; we will endeavour to reply as soon as possible, on a time-available basis. Best wishes and we are looking forward with tremendous excitement to seeing your projects!!!! Thank you for the photos, quite amazed, but a little confused. This may sound like a silly question but could you look at my photos (Hathern Primary School) and explain the orientation. Where is North, does the shadow run north to South? Does this help? ESOC is closed today, so we’ll have to wait until Monday to get a (proper, confirmed) reply from the MEX team. Hi Stephen: Here’s an annotated version of one of your images, showing the orientation; this prepared by Simon. Cheers! We printed out a number of images and posted them on a whiteboard. Then we began adding words and questions to the whiteboard: what we saw, what we knew and what else we needed to find out. We visited the University of Tartu Natural History Museum to find out about the geology of Mars. After the visit, we added more words, statements and questions to our board. During the final meeting we tried to answer as much questions as possible with the aid of literature and internet and decided on the content of the poster. The poster was finished for a Science Festival we had in Tartu last weekend and the visitors of the festival were able to read it. We also filmed the process but unfortunately were not able to secure everyone’s permission to publish this. Perhaps we will do a trailer version later. The poster gives an overview of Mars that is based mostly on what we saw from the images and the questions that came to our mind while looking at the pictures. The children were most fascinated about the volcanoes, possibility of life on Mars and of course, when will we land a human on Mars.